The Lambo 291 is the brainchild of former Ferrari wizard Mauro Forghieri and Mario Tolentino after being asked by Lamborghini to design a car around their powerful L3512 V12 engine. Lamborghini worked with Larrousse the year before but opted to get everything under its own control. Even though the car was essentially built with resources from Lamborghini, and powered with such engine, the company was adamant not to have the cars named Lamborghini as bad results could have had a negative influence on the company's image. The result was that the team was registered as 'Modena' and the cars as 'Lambo'. Forghieri managed to get a car ready by the end of 1990, after which it was tested at Imola by Mauro Baldi. 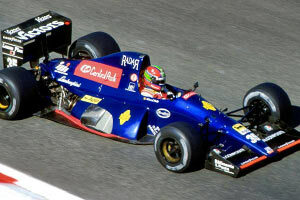 It appeared in a distinctive dark blue livery, featuring triangular sidepods and slanted radiators. The car proved reasonable and surprisingly recorded its best result at the first race it entered. After Larini qualified it in 17th place, the car held together and finished in 7th place, albeit 5 laps behind winner Ayrton Senna in a McLaren MP4-6. Still, the team came close to a points finish, notably at Imola where van de Poele was 5th in the final corner before fuel pressure problems dropped him back to 9th. Apart from those two 'highlights', the team didn't come close to points and usually failed to get through pre-qualifying. When the list of pre-qualifies was redrawn at Silverstone, the team found themselves lucky to be ranked among the best 13, thanks to that early 7th place finish. I proved of little use, as only Larini managed to finish a few times, although out of reach of the points.